The Samsung Galaxy A9 (2016) came into our office for a review, but we'll marvel at its 6" Super AMOLED screen later. For now, let's look at the chipset - it's our first encounter with the Snapdragon 652. It's a mid-range chipset, but it's Qualcomm's first (and among the first in general) to feature Cortex-A72, the successor to A57. It has four of them, plus four A53s. Basically, it's like the Snapdragon 810, but the big cores are next generation. The GPU is Qualcomm's 5th series, an Adreno 510, which promises a speed increase and power savins compared to the 4xx generation. It also supports the new Vulkan API, which is a low-level, low-overhead interface between 3D games and the hardware. That's assuming equal build and it's also the only place where the S652 truly shows it's mid-range character. It was built on a 28nm process (used since at least the Snapdragon 600 in 2013). That's compared to 20nm for Snapdragon 8xx and 14nm for the latest chipsets, including another 6-series entry, the 625. The manufacturing process is important for efficiency - more nanometers mean more power is used. This limits the clock speed that can be achieved with no cooling (like on a phone). Compared to the Kirin 950 used in the Huawei Mate 8, which also uses 4x A72 + 4x A53, the clock speeds are a good 0.5GHz lower. We'll see the impact this has on performance. We kick things off with AnTuTu 6, a full-system benchmark. 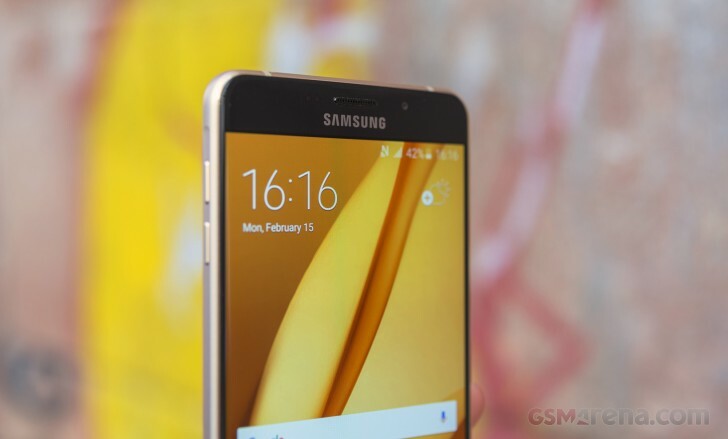 The Galaxy A9 (2016) trounces the A5 (2016) even though they are part of the same lineup. It also comes withing a hair's breadth of the S808-powered LG V10, a recent flagship. The Mate 8, Nexus 6P and Note5 have a significant lead, though. Let's investigate closer. The single-core performance of the A72 cores should be 20%-60% faster than an A57 clock for clock. That's the key though, the flagship chipsets are clocked high enough to offset this. Still, when all eight cores are engaged, the Galaxy A9 (2016) pulls ahead of the S810-based Nexus 6P. It comes close to the Galaxy Note5 too. Finally, the GPU. Adreno 510 is the base for the 5xx series, but even it should be competitive with the 4xx generation. Apparently not as fast as the Adreno 430 (probably due to clock speed reasons again), but it's as fast as the Adreno 418. It even matched the Mali-T880 in the Huawei, but that one is low on cores, just 4 (the Note5 has 8 T760 cores). We mentioned heat. You would expect a 28nm chip to get pretty steamy, but the Samsung Galaxy A9 (2016) and its Snapdragon 652 chipset run cool even under load. We'll be back with a full review of the A9 soon! A9 Antutu scores appear to be higher on other websites - maybe you need to re-run the benchmarks?? Reported scores here are very low! on A9 I got, I see Antutu 6 score of 77712 and GFX 3.1 Manhattan (1080p offscreen) of 16FPS. Give a retry on your device and post score. i feel heat and drain is coming!!!!! !